The All Things Good And Nerdy Podcast records live on Sunday morning. Streaming starts at 8:00AM Pacific / 11:00AM Eastern at www.Geeks.Live. Regular Participants: Naki, Anthony Bachman, Chris Ferrell and Willie D. Nelson. 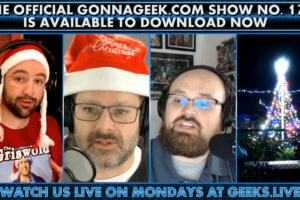 In this year’s Christmas episode of the Official GonnaGeek.com Show, Stephen, SP and Chris discuss latest news including Japan saving Christmas at the Space Station, Christmas problems in a little mid-west town, Amazon testing an easy grocery store, more problems at Fox, RCS text message platform coming to Canada and a big change you need to know about for future Christmas years. Lastly, Stephen FINALLY debuts his Wink insanity that he’s added since Chris first introduced him to it, in a segment demonstrating the system (you may want to watch the YouTube companion for this). A friendly reminder that we will not be recording an episode next week. Want to chime in for a future show? Call 567-343-GEEK(4335), tweet @gonnageek, email podcast@gonnageek.com or like us at Facebook.com/gonnageek. Want to chat during our LIVE recording? Join www.geeks.live on Mondays at 8:45pm Eastern. This Week’s Hosts: Stephen Jondrew, Chris Ferrell and Stargate Pioneer.